I’m a huge proponent of multiple sources of income. Ever since I read the 4 Hour Work Week, I felt the need to increase my passive income slowly but surely, with the goal of never having to work a full-time job again. I have multiple sources of income, but today I will focus on my newest venture: the online e-commerce store. My side hustle: MintedRepublic.com – an online e-commerce store that sells day dresses and other luxury women’s clothing. Sites like Gilt and Modcloth make a ton of money online. I thought, “Why shouldn’t I be able to get in on the action?” It seemed so simple really – just get a distributor, take some pictures, and start selling clothing. What could be easier? We ran into many obstacles along the way, but once we finally launched, we were able to enjoy a steady stream of dependable income. There are many e-commerce platforms to choose from. We chose Shopify because it came highly recommended by Tim Ferriss. Our site uses a premium theme that was customized by our developer and designer. We’re very particular with our brand. 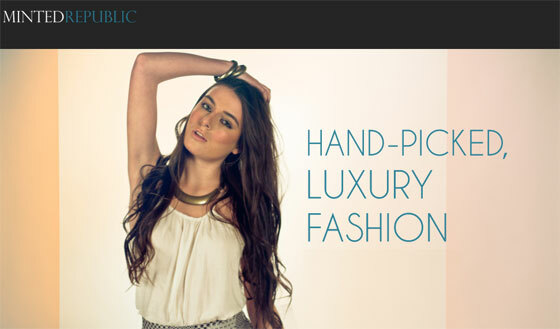 Because we sell luxury women’s clothing, the site needs to convey a high-quality feel that exemplifies luxury. We therefore went all out for the model and photography on the site. Model: We found our model through Model Mayhem. She just moved to Los Angeles from Seattle, so we got her as fast as possible before other retailers could get her. Expect to pay your model $400 – $800 for a day of shooting. Photographer: I previously worked with Kevin from Hotography on another project. I reached out to him for his photography services and we worked out a deal for a 2-day shoot for the catalog and the lookbook (a lookbook is a collection of photos put together to show off a model or a photographer, clothing line, etc). Expect to pay $3,000 – $5,000 for a day of shooting + final editing of photos. The women’s apparel world is highly influenced by fashion bloggers. We therefore reached out to popular and up-and-coming fashion bloggers to post up advertisements and for clothing reviews. It’s quite easy to find and get in touch with fashion bloggers. Most of them are looking to make money, so they’ll respond immediately to your inquiry. Expect to pay $100 – $250/month for advertising on a good fashion blogger’s site. The big ones will charge up to $2,000/month, but we’re not ready to advertise with them yet. How to find fashion bloggers: we’ve compiled a list of fashion bloggers that are looking to partner with online retailers. For a full list, email me. What kinds of people make ideal e-commerce professionals? Startup costs are quite high, so you’ll need to have a good amount saved up to invest in the venture. However, if you’re ok with having low-quality photos or if you’re a photographer, you can save A LOT of money by doing the photography yourself. You’ll spend the bulk of your time-investment in the beginning to set up the site, do the first catalog shoot, and approach fashion bloggers to put up advertisements. Once you launch and have a system in place to fulfill orders, you can sit back and manage the site at nights or weekends. Do note that each new season should come with a new catalog and lookbook shoot. If you have the capital and love fashion, then this could be a very promising venture for you. In a month, we can expect $24,300 in revenue. In your total calculations, you must of course take into account COGS (costs of goods sold), costs for advertising, and costs for photography. We hope to increase sales steadily in the coming months. Jun Loayza is the Co-Founder of RewardMe.com, a digital rewards program for restaurants and retailers. In his entrepreneurial experience, Jun has sold 2 internet companies and lead social media technology campaigns for Sephora, Whole Foods Market, Levi’s, LG, and Activision. **Have a side hustle of your own that’s interesting? Let us know about it! Awesome breakdown of your side hustle and great income potential if you love fashion. I just read the 4 hour work week as well. Great book and I have gotten a few ideas for my side business as well. Wow very interesting! I love reading about others side hustles. It looks like an expensive side hustle, but if done well, it could even turn into your sole income! Very interesting. Thanks! oh my god I wonder if I could do this.. not sure if I’d sell clothes though. Great breakdown, very cool to see. I’ve always wondered about drop shipping. I thought it would be neat but don’t know what product to sell. Nice to see a little behind the scenes. I love this idea, although clothes would not be the right item for me. What else could this be done with? wow, thats really fascinating. What would you say is your time commitment? This is awesome! I’ve always thought about opening up my own store, and finding a distributor, but I never went into it seriously. I thought about it 3 years ago when I first started a fashion blog. Many stores were popping up online and I got a ton of emails from advertisers. Should have done it when the time was right but I was in college and it obviously requires a lot of work and money and time I didn’t have. Awesome job though, so interesting to hear about the logistics of opening up an online store! Was your drop shipper open to placing single item orders at wholesale prices? Meaning, if you sold just one of a particular dress, they fulfill the order? Or, do you have to buy each item in a lot, at wholesale pricing? Just curious how you manage inventory. Glad y’all find this as interesting as I do! I consider stuff like this all the time but haven’t had the balls to pull the trigger yet ;) This is perfect for someone who has a great biz partner or shares a fellow passion with someone though – you can help motivate each other and split up the tasks! Def. cool stuff if you’re willing to take on the risk. Worst case you lose some money but gain valuable experience, right? My time commitment at the moment is 5 hours per week. I have my team run the majority of the business. The majority of manufacturers are not interested in selling single-items. It took some time to find the right partner. I flew out to LA to meet with them personally. I centered the pitch around how much more money they’ll make and that it won’t really cost then much extra in time or operations. We got the deal because of the pitch. They trusted me and we’ve been great partners ever since. You have a team too? That’s great! I’m guessing right now it’s not bringing in much of an income right now? Using most of the profits to put back into the business and grow it? Very impressive. I would love to do something like this. What a great side hustle. Thanks for sharing. Good stuff and very random Jun! Can you talk a little bit more about your start-up and operating costs? I’m alway fascinated to know what goes beyond revenue. How many ways do you have to split the proceeds? Let me know when you’re back up in SF to get a drink. @Christine Wilson – Yup, my team consists of 1 developer, 1 advertiser/designer, and 2 social media interns. Yup, the majority of our money is spent on advertising at the moment. @Financial Samurai – most of the startup costs were detailed in the post. Shopify is $59/month, the photographer cost about $8,000 for the initial 3 shoots, and we spent a good $7,000 in the first 2 months on advertising alone. getting ready to start my clothing business with shopify how many items did you strat with ? Super awesome fun time… best of luck Jun…. BUT is anyone looking at these number$ thinking maybe photography needs to be their side hustle hahaha! Oh man, THAT is hard. Everyone and their mother wants to do photography for $$$ and only like 1% actually kill it from what I see. I’d still give it a shot if I were super passionate about it all, but def. a trickier one in my opinion. More power to everyone doing it though! What about the operating and net profit margin though? What actually is left a month from the $10,000? The mistake most people make with drop ship is to buy a list that anyone else can buy. The OP did something very smart here by taking a distributor that is not online and offering a unique product online. This somewhat insulates the OP from competition on those particular SKUs. The OP has some front-loaded cost with getting the images online, but should be able to recoup and milk those photos for a long time. I’m curious what the actual expenses are though. Cost of goods, merchant account fees including fraud and chargebacks, freight, advertising, shipping supplies, processing returns. With drop ship, the distributor may not realize their costs and could raise prices later. I’m fascinated by your side hustle. A real inside look into setting up and ecommerce site. How are your revenues coming? Gook luck. Hi There fellow entrepreneur :) I would love to chat a bit about this type of venture. I am looking to create one of my own, and I’d love some tid bits and advice. Thank you and please email above! Great realistic and detailed article. I am in the process of starting an online clothing store myself and of course my biggest obstacle is finding a good distributor that of course not every store in my area is doing business with! If you can help guide me in the right direction… I would appreciate it ! As a single mom I am beyond tired of living check to check. Great article. I am looking for ways to make more income. I’d love to open an online shop. I started a fitness apparel company last year, LVL1 APPAREL. I’m an illustrator/graphic designer and am wading through the fun (difficult) times of learning how to become a businessman as well. So far, I have done everything myself, starting with the illustrations, to photography, even modeling the clothes (mostly between my wife and I), to setting up and maintaining the Shopify store, to social media, marketing, dropship and wholesale agreements, bookkeeping…there’s a lot to do if you’re doing it yourself. We are getting what I consider decent sales, for my first online shop, but struggling in the whole bookkeeping side of things. Trying to get that on track. But check out my designs at http://LVL1APPAREL.com, it’s been an exciting adventure. @J.Money I just discovered this article; could you update us on what happened with MintedRepublic.com? I see it’s no longer associated with a clothing site. Was the no longer worth the effort, not profitable? How did the website get shutdown. How would you avoid this from happening again? Looks like your store closed. Wow your site is wallpaper now? Did you change focus or did the deal with the fashion site break? I’m researching the success rates of these side hustles as I have one and want to take it to the next level. My options are opening a physical location or investing in the ecommerce.